It’s Monday, June 8th and nearly time for Apple’s annual Worldwide Developers Conference. We’ve already run down what we’re expecting from the conference, ranging from a significant iOS 9 update for iPads, iPhones, and iPod touches with a focus on quality, an upgraded version of OS X with the same core focus, the new Apple Music streaming service along with the new iTunes Radio, and the native software development kit (SDK) for the Apple Watch. We’ll be following the news closely from before the keynote, during the event, and after the event, and we’ll be live updating this post with the latest information out of the WWDC Keynote. You can find our live updates and analysis below, as we get closer to show time. – Apple Music available June 30th, 10 bucks a month. 3 month free trial. – Cue giving a demo of the new app. – Drake, yes, on stage talking about Apple Music. – Apple Music: Revolutionary Music Service, 24/7 Global Radio station, a station that only has one master, music itself. New Connect feature so artists can interact with their fans. – Apple’s Jimmy Iovine is up. – One more thing… Tim Cook about to announce new Music service. – WatchOS 2 to developers today, everyone this fall. Free update. – Siri gets HomeKit and Transit support. You can also now pull up individual Glances, for example Instagram. – Maps gets the mass transit capabilities as well. – Apple Pay gets all of those iOS 9 Apple Pay features discussed earlier. Passbook renamed to Wallet as well. – New Health/Fitness features that run natively on the watch. Third party apps contributing to Activity. Siri support for starting workouts. New Achievements in 3D with cool engravings. Sharable badges as well via iMessage, Facebook, and Twitter. – Now you can Reply to email in new WatchOS. You can also do FaceTime Audio for the first time. – Third Party complications support + Night Stand Mode for viewing key information with the time, alarms, and date. Multiple sets of friends in the Communications tab. Multiple colors in each Digital Touch. -WatchOS 2.0: New clock functions, new Health and Fitness, new Siri, new Maps and Apple Pay features. – WatchOS time + Native SDK. – Cook announces 100 billion apps downloaded. – iOS 9 for developers today, Public Beta in July. – Swift 2.0: Faster, more stable, open source. – CarPlay: Apps from the automaker so you don’t need to leave CarPlay, Wireless CarPlay for future cars, first tested with iOS 8.3. – HomeKit improvements: Security system, Window shades, sync out of the home via iCloud. – New HealthKit datapoint: Water, Hydration, Reproductive Health. 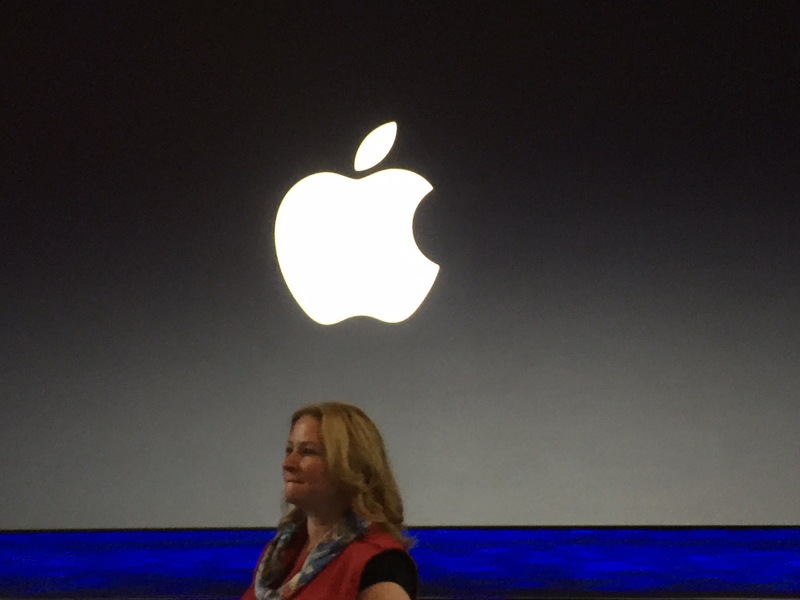 – Lots of new developer APIs in iOS 9, UI Testing, Swift 2, App thinning, Gaming APIs, Wireless CarPlay, Multitasking APIs. GameplayKit, Model I/O, ReplayKit. – iOS 9 installation is only 1.3GB, down from nearly 5GB needed for iOS 8. – Performance enhancements in iOS 9 as well. Addition of 1 hour battery life on iPhones with iOS 9. New low power mode, a single switch to extend battery life for additional 3 hours. – Finally. Split-screen iPad apps and Multitasking. New task switcher as well. Looks fantastic. – New iPad keyboard that acts like a trackpad, new suggestions, better copy/cut/paste controls. – News app. Content, sources, personalized. VP of Application Product Management Susan Prescott giving a demonstration. Looks like a better Flipboard. – New Browse Around Me feature + showing which stores support Apple Pay. These upgrades on iPhone, iPad, and Mac. – New Maps features. Transit. Multi-modal routing. Train, subway, bus, ferry, walking directions. Special care to get the details right, like intricate subway stations. Transit integrated into Siri as well. Baltimore, Berlin, Chicago, London, more and China. – New notes app with some enhancements: new font, inline images, formatting options, checklists for to-dos, sketching/drawing features + Linking from Safari to Notes. New outline for organizing Notes by attachments, photos, Maps links, website links. – Passbook is now renamed to Wallet. – Store credit and debit cards coming to Apple Pay: BJs, Kohls, and JC Penney. Loyalty and rewards cards from Walgreens and Dunkin Donuts in the fall. – Jennifer Bailey announcing new Apple Pay features: Discover card this fall, merchants expanding their support as well. Announces partnership with Square who is launching new reader. Launching in the fall. New Apple Pay support in apps added daily. Pinterest will launch support for Apple Pay purchases inside of their app later this year. UK Apple Pay next month, 70% of cards in the UK. – New San Francisco font, News app on Home screen, new Wallet app, new lowercase keyboard. – Apple announces Proactive, a Google Now competitor. iOS 9: Performance updates, iPad, more intelligent, new apps. – El Capitan: Fall release, public beta in July. Developer Beta today. Free. – Deep architectural improvements: Metal from iOS. – Much faster OS, 1.4x faster app launch times. – New Notes app, Split screen apps windows. – New San Francisco font. – Updated Mission Control: smoother, faster, updated UI. – New ways to search across system: Like searching Mail ignored from certain person, same in Finder and Spotlight. – New iOS Mail gestures in OS X Mail. New ways to pin websites in Safari, within the tabs bar. Muting/finding audio playing in the background in Safari. Game scores in Spotlight + Weather. – New Spotlight, enhancements to built-in apps, Window Management. – OS X El Capitan. – Cook says new updates to OS X, iOS, and watchOS (including native apps SDK). – Tim Cook talking about baseball. – Tim Cook talking about this being a global conference, 26th WWDC. 80% first time attendees. 350 scholarship winners. – Should be starting up here in under 10 minutes. – Gruber says over 2 hours for the Keynote. – Mark is going live on CNBC to talk WWDC at 8:15 AM, so stay tuned for that (update: video above). – Coming up on an hour until the keynote… Time to Stand. – Some news just an hour before the keynote: Apple could announce a Newsstand replacement geared toward hosting publisher content. Story here. While upstairs in the press area at WWDC bloggers are interviewing each other about their favourite Apple products. Hooo boy. – OS X El Cap it is? Apple Inc. is expected to announce Monday that it will start accepting retail store cards onto its Apple Pay mobile-phone payments system, according to people familiar with the situation. The move is part of a series of changes to Apple Pay that the company is expected to announce at its Worldwide Developers Conference, these people said. Retail store cards, also known as private label cards, so far haven’t been part of the Apple Pay system that was launched late last year. The cards, which are popular with consumers because they typically include special offers and discounts, can only be used at specific merchants. – Stream is up if you’re watching at the direct VLC link. – Apple’s stream is live on their website as well.